Home » CM Blog » Content Marketing » Does Your Company Stand for Something? Of course it does. You are likely saying you stand for value, customer service, quality, and integrity. Yep, and thousands, even millions of companies will say the same thing. But what are your core values, and are you willing to stand up for them publicly, risking public backlash? press coverage by all media outlets everywhere. They have been top of mind, top of trending, top of discussion by both supporters and opposition alike. Many out there would disagree with that, especially in this case. Every day more stories, rumors and allegations of their employment practices come out. More and more angry blogs and posts both in support and in opposition to them, come out. But they are trending, daily, on most platforms. People are talking about them, and talking about the causes in question. Consumers who support their views are showing their allegiance by going to a Chick-Fil-A and supporting them, posting about it, and taking pictures demonstrating their support. Likewise, consumers who don’t, are avoiding them. Some are scheduling protests, other scheduling appreciation days. Why was there a need to call out Chick-Fil-A? Why the forced outing? Companies everywhere are “targeted” for their actions by groups, always fighting for their causes. By going after well known names or brands, the causes get press as well. But did Chick-Fil-A have to be challenged? Weren’t their views clear? As a company they have always supported faith-based charities and causes. They have always been closed on Sundays, regardless of where they were located. Their beliefs, while not specifically stated in press releases and ongoing ad campaigns, were always a part of their company and easily found. Chick-Fil-A, either naively or bravely, took a stance and openly declared what they believe in. Whether you agree or disagree with their viewpoint, it certainly served to solidify their standing with their customer-base that are like-minded. Groups that support equality and Gay Marriage are rejoicing as news and stats come in about public support ratings of the company dropping. On the other side, customers who are aligned with the views of the company are now more likely to support them, making the company and their sandwiches basically a symbol for their causes. The plain fact is, as much as their public opinion rating may have dropped, that’s not necessarily reflective of their customer base. I, for one, would be interested to see the short term sales figures, to see if they fluctuated based on the announcements, and the longer term effects of their public stance. 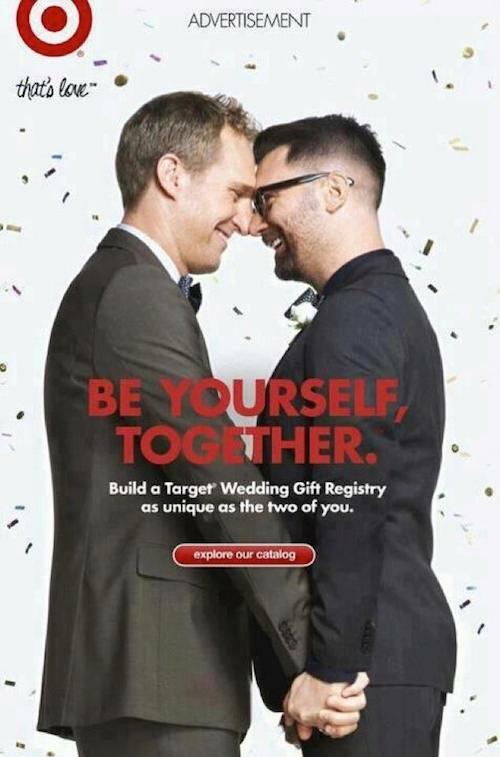 Target recently posted an ad that included two males as a cover for their wedding registry. Despite continued protests, Target has never come out publicly to take a stand for or against gay rights. They have been judged on their actions alone, such as stopping protesters outside their stores, stocking products that appear to be anti-gay. But they have not voiced the company position openly. The publication of this ad is interesting in it’s timing. (Some would say that it takes longer to create an ad so it must have been in the works. I call foul on that. I’ve worked in companies where we’ve pulled off ads and photo shoots in a few hours if needed.) Now, legions of customers are declaring their love for the company over this ad. To me, this stinks of commercial opportunism. Amazon’s Jeff Bezos has also just pledged $2.5 million to support the Gay Marriage effort. Would he had done that two weeks ago? Maybe, but this week it seems strange timing. And interesting that the news got such press coverage. KFC may also be playing a role in this media bandwagon. It’s not clear if this is real or not, if it’s an underground movement, or if it’s a corporate sanctioned campaign, but there are photos of KFC signage stating Great Chicken without the Hate. Again, nice idea, but stinks of opportunism. These actions are admirable, that they are supporting something they believe in and are also willing to make a stand, but could this also backfire? The question is not whether you support Chick-Fil-A in it’s viewpoint, but in a time when connecting with customers and being authentic is the rally call of marketers everywhere, we must applaud them for standing up for what they believe in, and going public. It is their choice to do that. But, they slipped up, BIG time. Their social media fiasco, broke the cardinal rule of authenticity. Creating a false identity, creating a false cover story, and promoting a backstory that doesn’t hold up stinks. It’s the opposite of authenticity. 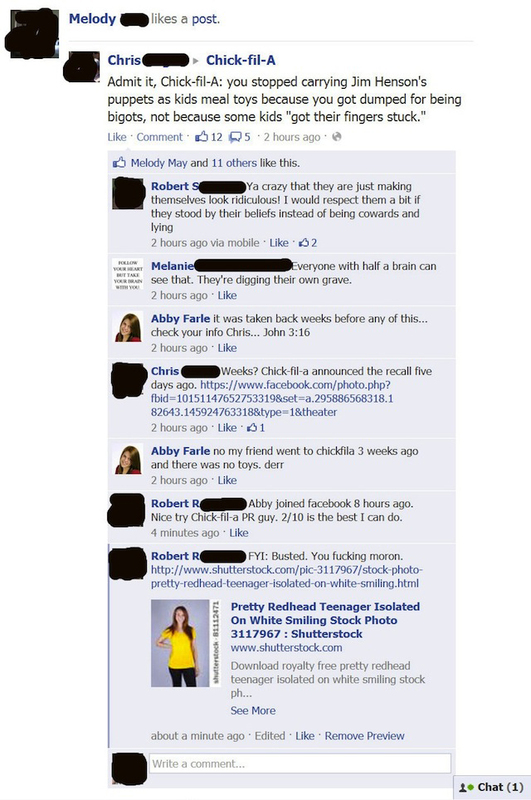 That undid all the respect for standing up for what they believe in, at least in my book. When the lying and manipulating starts, then you just become a target. ← Blame it on the Rain – Are You Making Excuses for Your Marketing?